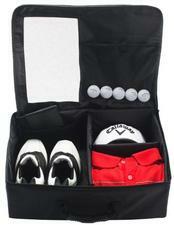 Arrange your golf gear in your trunk or golf locker with the Callaway® collapsible equipment organizer. Easy access compartments provide secure storage for shoes, hats, valuables, and other essentials for your trip to the course. Rigid wall dividers and easy-pull zippers keep your equipment separated, while mesh material allows for adequate ventilation. When not in use, the locker quickly collapses flat for fast and easy storage. Locker measures approximately 19" x 15" x 6.5"
If you have any more questions about the Callaway Golf Trunk Locker (Dimensions 19x 15 x 6.5); do not see the model you are looking for; need custom options; or prefer to not purchase online, then please call us at (630) 656-1291.